We at Town & Country Inc., Realtors believe that our company offers the best training, tools, and managerial support you need to be a successful Realtor. A career in real estate provides flexibility and a level of control over your personal and professional life. Successful men and women in real estate are goal-oriented, self-motivated, disciplined, ambitious and customer service focuesed. For the right individual, a career in Real Estate allows you to take control of your future. Your Career in Real Estate . . .
Am I willing to make a fulltime 100% commitment to a career in real estate? Can I commit to working irregular hours such as evenings and weekends? Does commission only income fit my lifestyle? Am I committed to become Quality Service Certified? 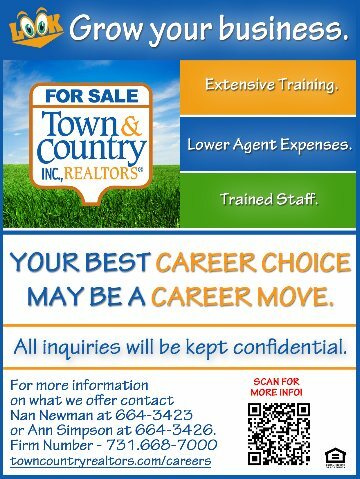 At Town & Country Inc., we feel that extensive training is necessary to your success as a sales partner. Once you have successfully passed the state exam you are ready to enter into the Town & Country training program. Town & Country training gives a newly licensed Sales Partner the ability to rapidly accelerate to a fully proactive Sales Partner. The program uses approaches to build knowledge, skills, and attitude necessary for developing a successful sales career in real estate. Our training is based on the conviction that success results from building a knowledge base through teaching and self-study and developing appropriate skills and attitude through field practice, continual coaching and counseling. Tools and training will be provided to get you up, running and earning an income in the first 30 to 90 day after entering the program. You will be coached on everything from conducting open houses, personal marketing and listing proposals to how to write contracts and agency law. Contact TREES. Complete your real estate pre-license classes. For class schedules and information about TREES, log on to www.tntrees.com or call 1-800-572.8733. Not sure what to do next? Contact our Office Manager, Ann Simpson at 731.664.3426 or asimpson@tcincrealtors.com for more information.